Shark + tornado = Sharknado. Of course, it's the only logical explanation! What more of a plot do you need than that? Let's hope you don't need much more, because there isn't anything more than that. We are fans of awful movies such as "Mega Shark vs. Giant Octopus," "The Room," and "Troll 2" because they are just that: awful. They cross a mythical line where a movie becomes so bad, it's actually entertaining. Though it might not have been the director's ultimate intent to make a successful, laughable, apparently amazing piece of pop culture, "Sharknado" has become all of these things. Don't go into this movie expecting good acting, good directing, good writing, or even a good story-line, none of this exists in the world of "Sharknado." You can, however, expect a lot of laughs, whether intentional or not, and a whole lot of sharks falling from the sky which also happens to be filled with tornadoes. In Los Angeles. Looks like Ian Ziering never left Beverly Hills. 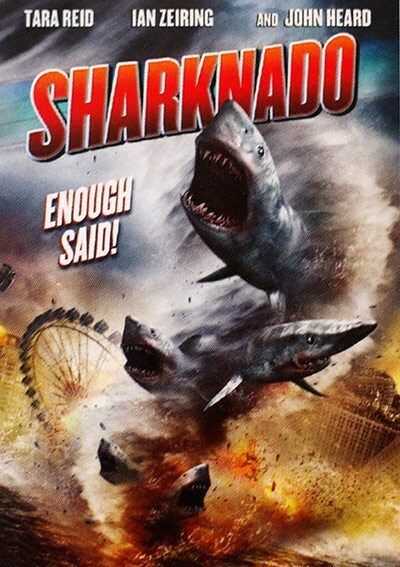 If you like hearing Tara Reid "act" her way poorly through lines like "what's wrong" and "I can't believe you!," you'll be happy to know she's not cast in the sequel, which I affectionately call "Sharknado 2: The Sharkening." Do we recommend the movie: Yes! Abso-frickin'-lutely. **SIDEBAR** It takes a special kind of maniac to find joy in this movie, just keep that in mind, don't say we didn't warn you. ZOMBIE BEAVERS! YES!!! We are so looking forward to watching that movie! These kinds of movies are excellent if you're in the mood for them. Unfortunately, "Sharknado 2" was not as good as this!